The ethical pitfalls of eating the steroidal flesh of murdered livestock may keep you from lifting that shrink-wrapped package of ground beef out of the refrigerated bin at the grocery store but, no matter how good Smart Bacon is (and it's actually okay), no meat substitute can quite replace the delicious taste of a freshly slaughtered animal (especially if that animal produces bacon) and no animal can be slaughtered for food without a touch of deliberate callousness. Except, of course, for roadkill. British artist Alison Brierley has a really strange pregnancy craving, and it's not peanut butter and wasabi sandwiches or eight-cheese quesadillas (with gruyère and brie): it's roadkill. Brierley, a self-described "food forager," has always had a little bit of a jones for hapless street-crossing creatures fresh off the tread, but says that her craving has intensified since her pregnancy. "It's probably because I need all the extra iron I can get at the moment, what with all these extra red blood cells I am making." That's probably it. She adds that roadkill has a "gamey" taste that she really likes and that it's a guilt-free meal because she knows whatever animal she's eating has had "a completely free-range and natural life," which should make all you people who feel good just by shopping at Whole Foods take a long look in the mirror. Roadkill has been a source of food for poor people since there have been cars. In American culture. In American culture, eating roadkill generally has a pejorative, classist conotation, epitomizing ignorant, hillbilly behavior. Now Wildroots [a collective in North Carolina that eats so much roadkill they have to stash it away in a freezer just like in every urban-youngsters-go-camping horror movie you've ever seen] and other enthusiasts are embracing roadkill with a political ideology, rejecting the values of consumer culture by "transforming dishonored victims of the petroleum age into food which nourishes, and clothing which warms." Roadkill has made some inroads into the mainstream, from roadside restaurants like the Roadkill Cafe in Arizona — whose charming motto, "You kill it, we grill it" has brought patrons from all over the country — to a recent law in Illinois legalizing roadkill scavenging. What you're probably wondering is, "How long before I see squirrel frying in a pan on Top Chef?" Only the most impatient epicureans can't make time to slow-cook a squirrel. It's wonderful, or so I'm told by the internet. 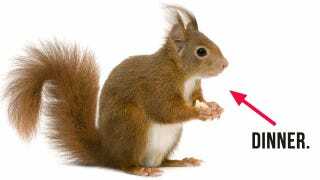 You'll want 2 squirrels that you or someone else murdered recently with a car, skinned, gutted, and cut into itty bitty pieces. You'll want to put the squirrel pieces into a slow cooker with 4 quartered potatoes, 1 pound of chopped carrots, 1 chopped green pepper, 4 sliced onions, 2 cups of water, ¼ medium head of cabbage, 1 teaspoon salt, and one teaspoon black pepper. Cook on low for 8 hours. Serves...you'll probably want to just keep this one to yourself. According to the roadkill recipe site, "woodchuck" and "groundhog" are different names for the same animals, which surprises me for some reason though if it doesn't surprise you don't be smug about because we all learn something new everyday. Like how to fry a woodchuck (or groundhog). Clean a woodchuck however you prefer, cut it into six or seven pieces, and parboil it in salted water for an hour. Remove the meat from the broth and drain. Drag the meat through a mixture of salt, pepper, and flour until it's thoroughly coated, I'd say ‘ready for winter' coated as a way to judge. Melt cooking fat in a frying pan and cook meat until brown. Serves six reluctant diners. I don't know who Dr. Bob is, but I'm sure he received his doctorate from a degree-granting university, probably one that kept the vending machines well-stocked with citrus colas. Dr. Bob instructs any adventurous chili lovers to take four pounds of fresh roadkill, a can of Sprite or 7-UP, black pepper, jalapeno peppers, chili powder, four cloves of crushed garlic, green onions, oregano, cumin...pretty much whatever is languishing in your spice cabinet, a can of tomato sauce, and a green bell pepper, and mix all that stuff together, probably in a pot, though strangely the recipe doesn't specify. I don't recommend that you make any of these dishes because I'm sure there's some sort of legal something that I should be careful about but, well, if you're really hard-up and you need to eat roadkill, just remember: they ate rats and leather on the Mayflower and if those people saw free dead animals just lying on the side of the road, you bet they'd eat them and thank Providence for the bounty. And all this just in time for Thanksgiving!